This recipe is written in my mom's handwriting (Sue is Grammy's second daughter). 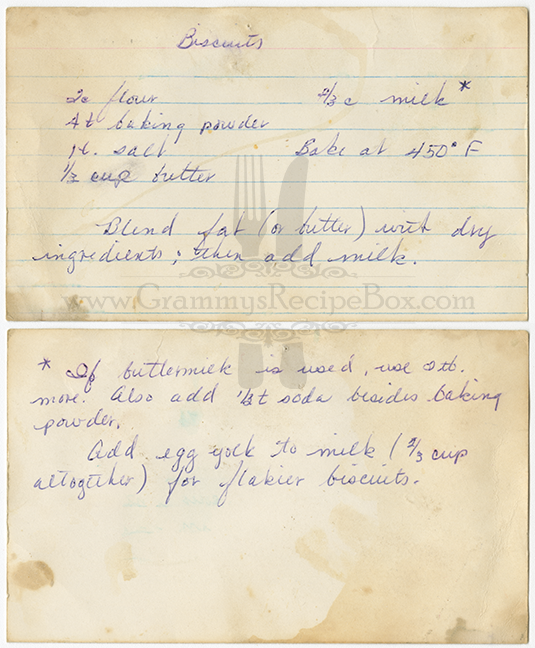 The biscuits were a family favorite in our home when I was growing up. Based on the staining on my Grammy's copy of the recipe, I'd say it became a favorite of hers as well. My mom would bake these biscuits at the same time as she was making a savory beef and vegetable stew or homemade turkey and rice soup. She took the time to split and pre-butter each biscuit as they came straight out of the oven, so by the time they hit the table, the butter was all melted into the insides of the biscuits. Yum! If using buttermilk instead of milk, use 2 tablespoons more of buttermilk. Also, add 1/3 teaspoon baking soda in addition to the baking powder.